Saddlebags Custom. Free Spirit Eagle XL. 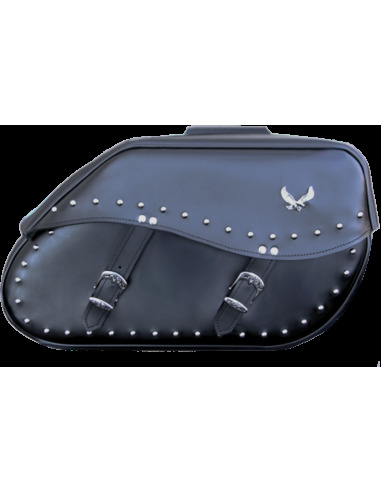 Saddlebags Custom Free Spirit XL Eagle. Decorated with ball rivets and a metallic eagle. Saddlebags Custom Free Spirit XL Eagle. Decorated with ball rivets and a metallic eagle. Classic and modern model at the same time. It adapts to most motorcycles. We use thick leather, 3mm. It has reinforcements in the back, in the band, and in the front, to avoid deformations. This product can be customized according to your preferences. Vary the measure and the color. Include the drawing, name or photograph you want. Embroidery, or laser engraving, depending on your tastes. When you place the order, you have a comment box, to explain how you want the customization. PLEASE, HAVE A LITTLE PATIENCE AND VISIT US FREQUENTLY TO SEE THE NOVELTIES. Or click here to learn about cookies.